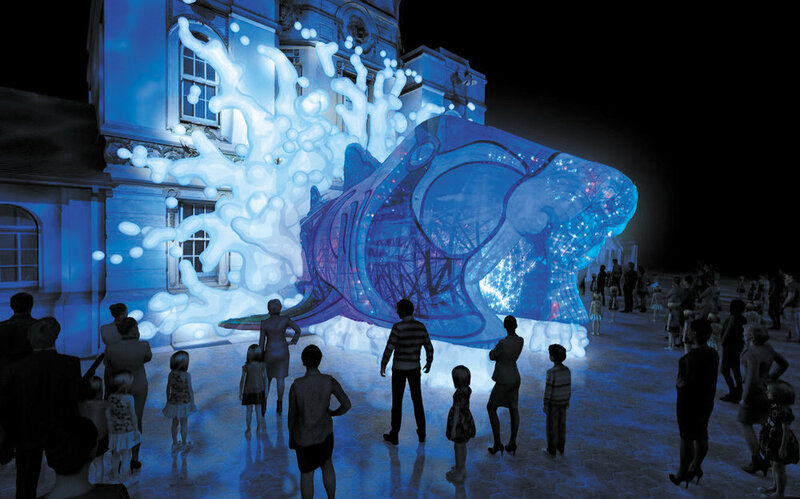 Vivid Sydney brings light art, music and inspiring ideas to town, including impressive design talents. Strike a light! Vivid Sydney returns to illuminate the city for 23 nights, from Friday 25 May to Saturday 16 June, celebrating its 10th anniversary with a vibrant mix of light, music and ideas. The largest festival of its kind, Sydney's winter-warmer promises eye-catching projections, light art, interactive installations, live bands and cutting-edge talks, with illuminating speakers, exhibitions and workshops. This year's Sydney Opera House sails will be illuminated by site-specific kinetic digital artworks by graphic designer Jonathan Zawada. Entitled 'Metamathemagical', the 15-minute, recurring light show envisages Australia as an 'elemental, timeless place that is also completely new and full of energy.' We're big fans of the celebrated Australian artist, and recently explored his work with electronic musician Flume. Byron Bay-based Zawada took inspiration from Australian nature and its unique flora and fauna for the Vivid project. Responding to the 3D form of the Opera House's architecture, rather than treating it as a flat plane, Zawada drew on images of flowers, plants, feathers, rocks and human figures to craft a hyperreal 'saturation of colour, pattern and texture' (for more insights see this video interview). The visuals are teamed with a soundtrack featuring Air Max '97, XO and EPROM. Always a highlight, the façade of the Museum of Contemporary Art Australia (MCA) will be animated by 'Virtual Vibration', a blend of psychedelic art and more formal modernism. The large-scale projection mapping is a collaboration between Australian artist Jonny Niesche, electronic musician and composer Mark Pritchard and the Spinifex Group. Expect a shifting, sensory light experience playing with transparency, reflection and movement, set to mesmerising sound. Sydney Opera House curator Sarah Rees will join 'Jonathan Zawada and Mark Pritchard in Conversation' (5pm-6pm, 27 May), a talk highlighting the frequent collaborators' work and recent 13-minute film project 'The Four Worlds', inspired by Pritchard's haunting, ambient album of the same name. Zawada is responsible for the 'Lighting of the Sails' digital art illuminating Sydney Opera House this year, while electronic producer Pritchard's music is part of the nearby MCA's installation. Zawada has also created artwork for Pritchard's previous albums. Catch free screenings of the otherworldly film at The Samsung Lounge from 25 May to 16 June. Interactive lighting display Skylark lets visitors put their own colourful mark on the city, lighting up Sydney Harbour Bridge and the surrounding skyscrapers of Circular Quay. Designed by Australian talent Iain Reed of 32 Hundred Lighting, this year's version of the attraction includes a dynamic new feature, Bradfield's Beacon, a custom-built, interactive laser atop the Bridge that's double the strength of any laser seen in the Harbour before. It will wash the Harbour and its headlands in colour, while 40 pillars of light above the Overseas Passenger Terminal adds to the spectacle. Vivid packs a musical punch, with an extensive line-up of live bands, DJs, club nights and parties, including major acts Solange and Ice Cube. Our pick is Dreams on 29 and 30 May at Sydney Opera House. Exclusive to Vivid LIVE, it's the Australian premiere of the band, an intriguing collaboration between two of the country's most iconic musical talents: Daniel Johns (former frontman of Silverchair) and Luke Steele (Empire of The Sun, The Sleepy Jackson). If their recent tracks 'No One Defeats Us' and 'Silence' are anything to go by, the duo should deliver darkly charismatic performances and a bold, experimental sound. The annual Good Design Festival takes over two floors of the Overseas Passenger Terminal in The Rocks from 25 to 27 May (7.30pm-10pm Friday, 4pm-10pm Saturday and Sunday). The established showcase includes a retrospective of the past 60 years of Australia's Good Design Awards, shares 260 award-winning international projects from 2018's awards, and predicts future talents in the NextGen winners category. The free public exhibition gathers diverse designs, from the Sydney Olympic torch to a deep-sea submarine, electronic bike, suspension tent and museum architecture. Book tickets online for the official launch party (5.30pm-7.30pm, 25 May) and for the 'Good Design Exchange' (6pm, 26 May), a talk hosted by Good Design Australia with graphic design whizz Vince Frost, CEO of Frost*collective, and other speakers.